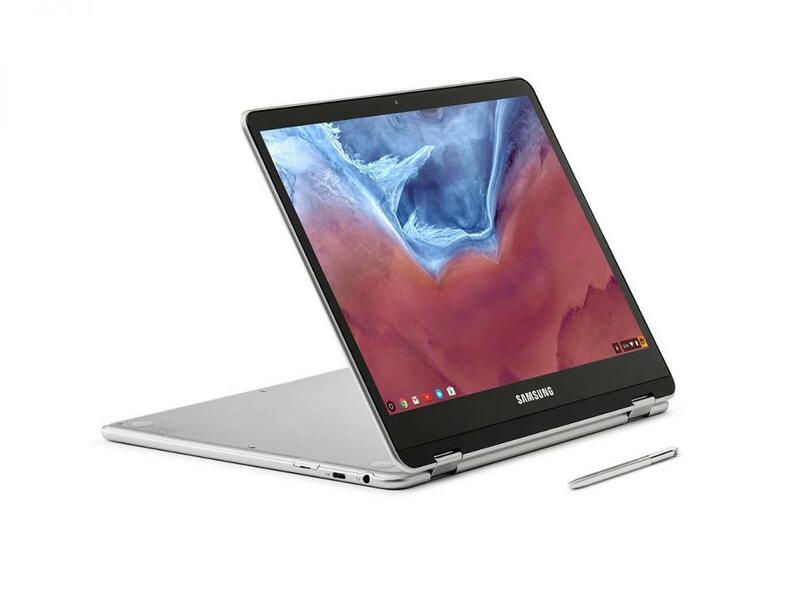 The Chromebook market has been one of the bright spots in the computer market along with Windows convertibles and detachable PCs. While Chromebooks don’t run a full, desktop operating system, it does run Chrome OS which gives it some pluses, namely simplicity, security and browser familiarity with some disadvantages too. These limited abilities work fine in scenarios where educators want to deploy a productivity computing environment for students or for consumers and enterprises that have no desire to use a computer for anything other than web browsing where all their apps are on the web. Chromebooks have been selling so well that they outsold Macs in Q1 last year, so something is working. I wanted to take a look at the latest and greatest Chromebook from Samsung announced at CES 2017, the Chromebook Plus, and see how it handles productivity tasks. I used the Samsung Chromebook Plus for about 2 weeks as my secondary system. My primary was a desktop PC with three displays when in the office and a 13-15” thin notebook when traveling. I shadowed my regular laptop and desktop usage and reveal to me its ability to replicate my daily productivity and entertainment needs. Because the Chromebook Plus can run now Android applications, I installed numerous popular Android apps to test myself but I did not run any peripherals or additional hardware. Those Android apps included, OneDrive, Twitter, Hangouts, OneNote, Play Movies, Photos, Docs, Sheets, Slides, Outlook, LinkedIn, Messenger, CPU-Z and Device Policy (did not work). These apps are designed to help cover an array of usage scenarios without going overboard on the overall number of apps installed and their exact purposes. Office 365 apps would not load, which I’ll get to later. As a classic Chromebook experience, the Samsung Chromebook Plus exceeded my expectations in display quality, industrial design and versatility. Adding the Android app dimension was a utility improvement for sure, but that experience needs refinement as it’s a bit rough. I expect that enterprises will need to wrap their heads around using Chrome OS plus Android apps before they dive in with all limbs. 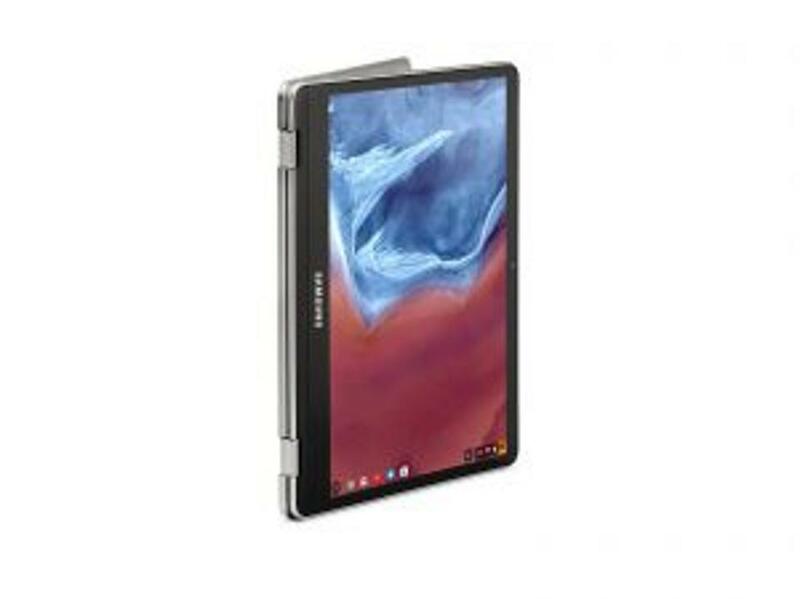 The Samsung Chromebook Plus has a high-quality thin (1/2-inch), all-metal industrial design that is also lightweight (2.38 lbs) and did not suffer from bending issues either as many other thin devices do. A 12” 2-in-1 PC could easily weigh a pound more than this Chromebook. The Quad HD 12.3″ display which has a 2,400 x 1,600 (234 PPI) resolution with a 3:2 ratio was wonderful and the best display I’ve used in a Chromebook. Because of this display, videos on YouTube in 4K as well as Play Movie store in 1080P looked great without zero lag or tearing. The Chromebook Plus included a pen was very convenient and hard to lose and I didn’t experience much lag at all. It’s not like writing on a Surface or iPad Pro but pretty good. It isn’t particularly for the “use all day” pen crowd but that’s okay as it’s good to use occasionally. The pen worked well with both Google Keep and OneNote and I could take hand-written notes in Keep and then search for it. That feature is very, very cool and removes one huge barrier to taking pen notes, the inability to search. The full-size keyboard with multitasking and “shrink window”, volume and display keys was a nice thing to have. I liked that the Samsung Chromebook Plus is a 2-in-1 convertible that’s actually usable at 1.38 lbs and with a 3:2 aspect ratio. As a comparison, this Chromebook is lighter than the original iPad (1.5-1.6 lbs) and the original iPad Retina Display (1.44-1.46 lbs) but is still heavier than the latest iPad at less than 1lb. If you’ve every tried to use a heavy 2-in-1 as a tablet, it gets tired fast. The Chromebook plus also has an HDMI video out feature, but I didn’t try it unfortunately, so I can’t speak to the quality of that experience. It also has a tiny power cord, which is a good thing because power cords should always be as small as possible. It also has two USB Type-C ports for expandability and forward compatibility with future Type-C devices. Most Chromebooks have horrible, old-style USB ports with no future. Even though I liked a lot of things about the Samsung Chromebook Plus, there were some things that I think will be “don’t care”, “wait and sees” or doesn’t matter. First off, the Chromebook Plus bogged down a bit when running some Android apps. Notifications from Android apps seemed delayed on some apps or the app had to be open to receive notifications. Overall, the Android app experience did not feel entirely fluid or fully connected yet to Chrome OS. While Chromebooks aren’t fully designed to run Android apps well yet, it is a key Samsung selling point. It has been a year since Google announced Android on Chrome, and I would have expected more. I also suspect that for some people moving from Windows may be a bit of a challenge with some of the barriers I’ve encountered. The lack of a delete key to delete things like emails and text when I am writing is a bit challenging and the lack of a right click on the trackpad is also a bit hard to get used to. However, using right click with a mouse is no problem, which means it could be a design choice of Samsung’s. It’s also hard to know how to take a screenshot as it doesn’t have a PrtScr (print screen) key like every Windows laptop already has by default. For enterprises, I believe they will need to wrap their heads around Android apps on Chromebooks. Enterprises like and trust Samsung Knox and that’s only for Android, but enterprises don’t get that on Chromebooks. Many enterprises see Android apps without Knox as risky, so it will take enterprises time to study this. In the meantime, enterprises can use the Chromebook Plus as a Chrome-only device to their heart’s content. Again, these aren’t necessarily negatives, but don’t cares or doesn’t really matter. There are no perfect products and my 25 years in products always makes me the “expert”. That’s a joke, please smile. The Samsung Chromebook Plus has some room for improvement in certain areas, like my experience that the Chromebook seemingly bogged down whenever I had anything over 10 web tabs open simultaneously. I am a power user and not every Chromebook user will be one. I also had issues with the Spectrum TV web experience as it was pixelated and did not look good, and I didn’t have any issues on my PC or iPad. Spectrum TV runs off Flash video, which may explain the issues.. Office 365 apps were also not available in the Android store like Word, Excel and PowerPoint, which is a shame. I checked in with Samsung, Google, and Microsoft and didn’t receive any answer on why this is the case. I spent two weeks with the Samsung Chromebook Plus and it was impressive in most ways but could use some work specifically on the Android app integration. As my latest check-in with Chromebooks, it looks like Chromebooks have come a long way but have a way to go to be competitive with Windows laptops when it comes to productivity and performance, however it appears that the hardware is absolutely catching up. Hopefully with more time the Android integration will mature to a point where Chromebooks can deliver a more consistent experience and stable and prolific Android applications. 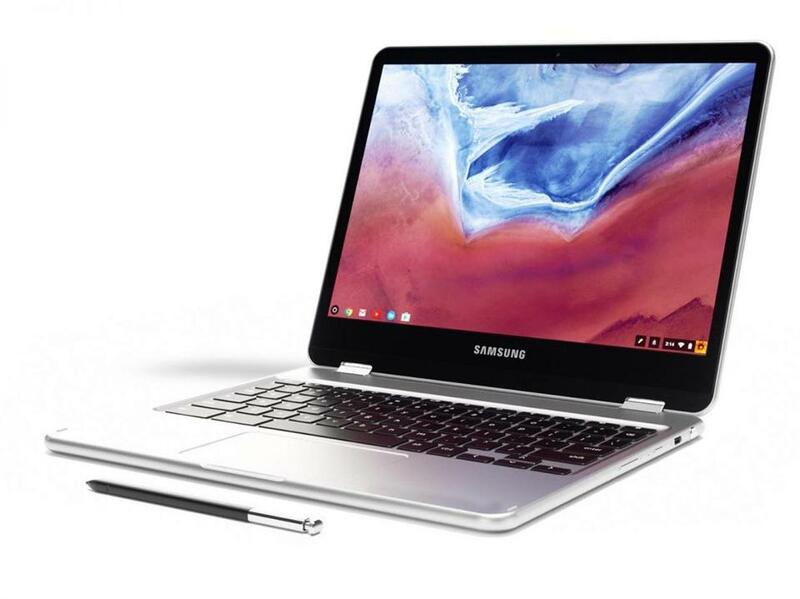 As a reminder, many educators like Chromebooks the way they are and if I just measure Samsung’s Chromebook Plus on that index, it would be a really good experience, great in many ways. Samsung did a fantastic job with the hardware on the Chromebook Plus and now Google just needs to get it over the finish line.